Why? That’s the question. Why would anyone in their right minds set up an independent publishing house and run it from a little office in a little old fishing town in little old Essex, and then decide to publish a book that combines beautiful illustrations of migratory wading birds with descriptions of the geography and habitat of the places where they make their temporary homes – from the Arctic circle to Africa – and then add in some meditations about conservation and human migration, touching on the big issues of refugees and the war-torn parts of this world? Why? Why? Why? Well, because we can. As a small indie publisher we’re not fighting with the big guys who are looking after their margins, set against huge outlays and large potential audiences. We’re not shouting for virtual shelf space on Amazon or setting out our stall to lure in the readers of blockbuster genre fiction. We know we are niche. It’s nice being niche. 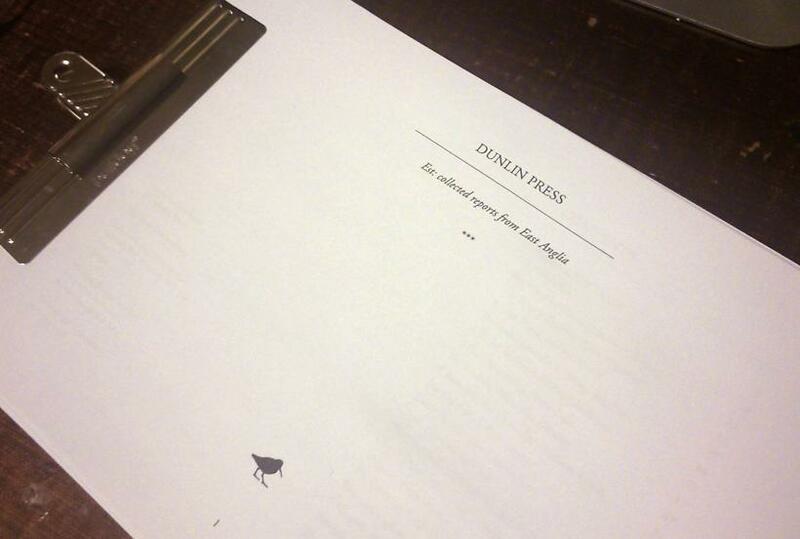 It’s the reason we’re called Dunlin Press – we’re the little guys feeding in the margins. We’re not looking to be mainstream. Our first book, Est: Collected Reports From East Anglia (£9.99) is an evocation of a region – as its title hopefully suggests. But it’s not a local history book, or a travelogue, or a collection of local poets or other writers – although it includes all of these things. Est is more than the sum of its parts. It doesn’t set out to define East Anglia, in fact a better description, perhaps, is that it ‘dedefines’ the region. East Anglia, by the end of the book, dissolves – crumbles into the sea. And so our second book, The Migrant Waders (£12.99), was never going to be simply a nature book or an ornithological guide. Alongside contributions from the RSPB and BTO there is poetry; alongside micro-histories of human migrations there is psychogeography and words from the Refugee Council. And those lovely drawings. The migrations of humans and wading birds aren’t always entwined, of course. But the reasons that humans and birds take flight are remarkably similar. It’s about finding a safe place to make a home. And, by the way, those beautiful birds really do follow a flight path to locations where human history has often been one of turmoil and war. It really can be quite sobering. We made The Migrant Waders because we can. There really is no other book quite like it. We will be launching our second book, The Migrant Waders, at Church Street Tavern, Colchester, Essex, on Thursday 21 April, at 7pm. It’s a free event, so please do come and join us to help celebrate. The evening will include readings from contributing authors, discussion with Ella Johnston about the wonderful illustrations that appear throughout the book and, of course, the chance to get your hands on the book itself. We hope to see you and your friends there. The Migrant Waders is a collection of illustration, evocative prose, poetry and reportage that follows the migration routes of wading and shore birds from the high arctic to the tropics. Taking in the histories of the people and places where the birds make their temporary homes, the book includes 21 ink and watercolour illustrations by Ella Johnston and contributions from nature and landscape writers, as well as leading ecologists and environmentalists. This is our manuscript for Est: Collected Reports from East Anglia, and in it we’ve laid out the submissions that have made it into the final publication, due for publication in February 2015. But who’s in it? Well, we have an amazing selection of poets, fiction and travel writers, journalists and the occasional academic and we’ll be revealing the names during the course of this week via our Twitter feed. You are following us, aren’t you? We’re very pleasant company. No? Look, we’re here: @dunlinpress. It’s getting exciting now, so do make sure you check back for updates.